A major piece of Star Wars mythology just got a major twist, as Marvel's release of Darth Vader #25 reveals that the supposed immaculate conception of Anakin Skywalker was actually part of a much bigger, and darker, plot of The Sith. Warning: MAJOR SPOILERS for Darth Vader #25 follow! As you can see in the image above, Vader is on Mustafar in his castle, trying to access the Force through the planet's powerful connection to the dark side. Vader manages to breach the planes of life and the living Force, appearing as a Force energy silhouette, as he traverses through the the pivotal moments of his life. One of those moments is one that Anakin Skywalker never actually got to see: the seeming moment when his mother, Shmi Skywalker was impregnated. In Star Wars: The Phantom Menace, Shmi tells Qui-Gon Jin that Anakin had no father, that she simply became pregnant and had him. Qui-Gon senses that Midi-Chlorians inside Anakin are unlike anything he's ever seen - and now we know why. As the scene depicts, Darth Sidious (aka Emperor Palpatine) appears as a Force projection and wraps his arms around Shmi, using some king of Sith sorcery to create baby Anakin. Since this comic is official Star Wars canon, it can now be said that Palpatine is in fact Darth Vader's father! 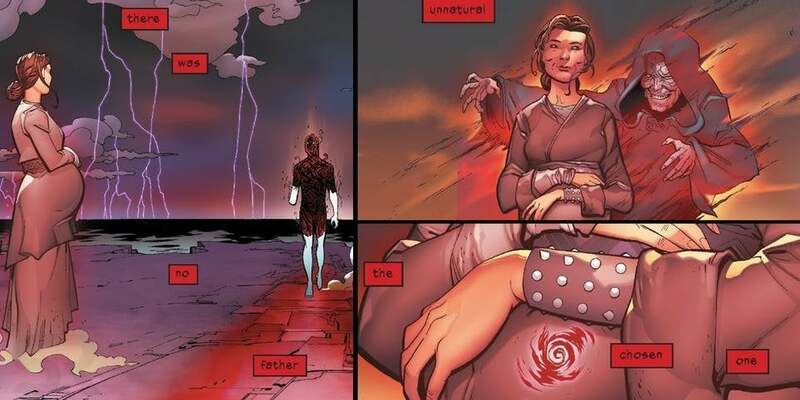 As Screen Rant details in a very extensive breakdown, this moment isn't just some Star Wars gimmickry: the creative team of writer Charles Soule and artist Ciuseppe Camuncoli are actually tapping into a lot of deep strands of Star Wars mythology - specifically a lot of what was suggested in the old Expanded Universe mythos, in regards to Darth Sidious' Sith master, Darth Plagueis. While this small detail of Anakin/Vader's backstory is ostensibly a way to ground George Lucas not-so-subtle religious allegory, it will no doubt help to fuel endless new (and specious) fan theories about Palpatine or Plagueis possibly being revealed in Star Wars: Episode IX, as the canon has now provided context for such a drastic twist to happen. You can pick up Marvel's Darth Vader series on shelves. Star Wars: Episode IX hits theaters on December 20, 2019.